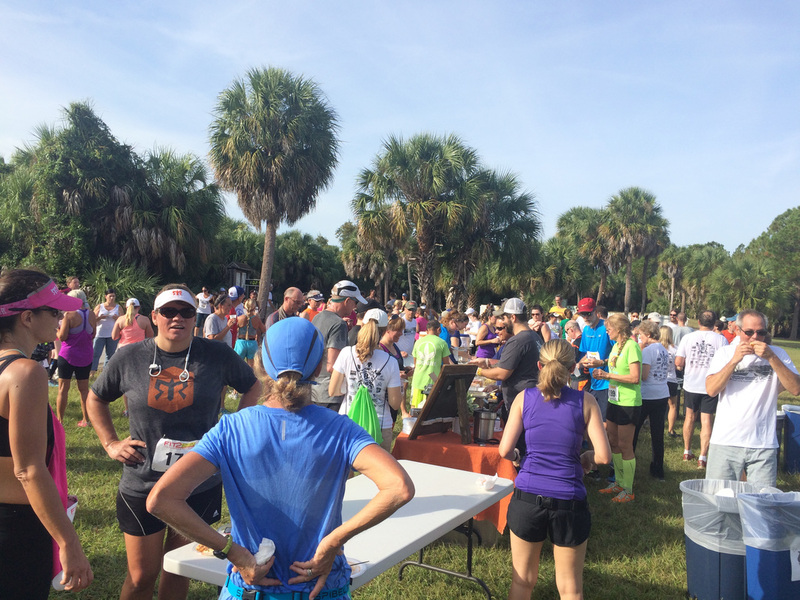 This trail race is staged by the Friends of Weedon Island. 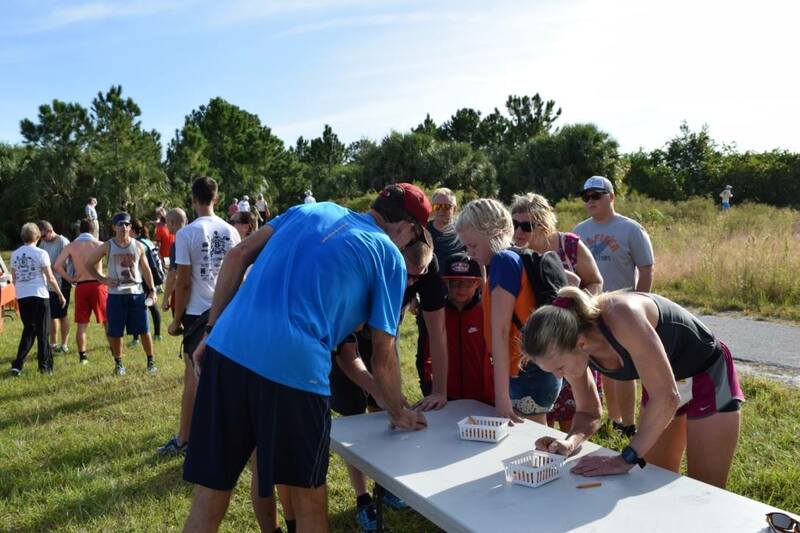 All proceeds from the race go towards environmental restoration, and education at the preserve. 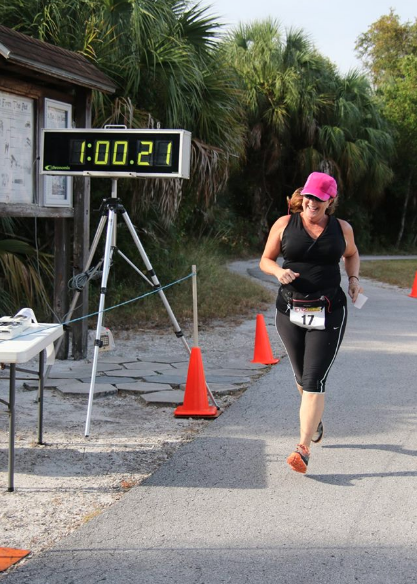 The race is an 8K (4.971 miles) run entirely inside Weedon Island Preserve, in St. Petersburg, Florida, next to Tampa Bay. 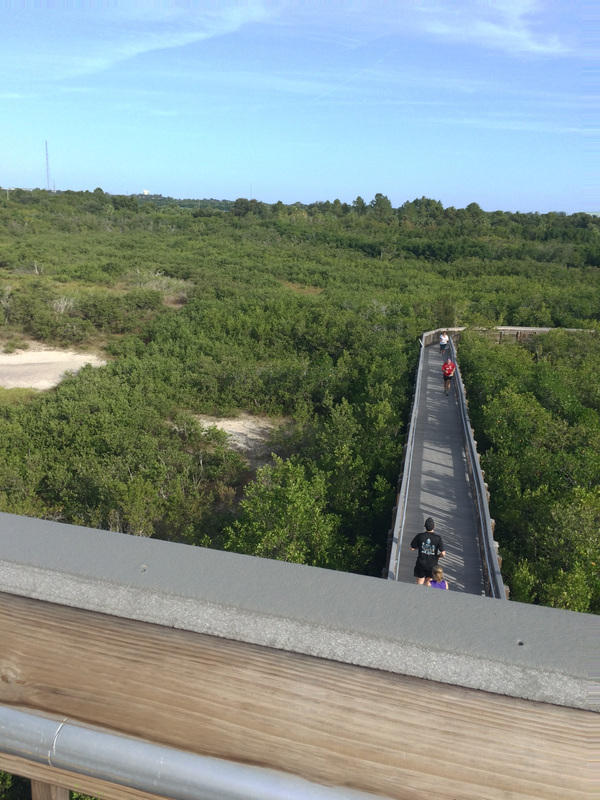 Participants run through mangroves, salt marsh and Florida scrub habitat. The trails are a variety of dirt, paved cement, soft sand, crushed shell and boardwalks. Packet Pickup: Pickup was available the day before the race in downtown St. Petersburg at Fit2Run. Packet pickup was available on race morning beginning an hour before the race. No expo. Aid Stations: Water stops at mile 1 and 3. Parking: Easy and free parking was in the Cultural and History Center parking lot. The race is limited to 200 entrants, so parking doesn't seem to be a problem. Volunteers used a separate parking area. Cost: 8K $30. This race has limited entries because it's run on the nature trails. The race sells out, so register early to get your chance to run this beautiful course. 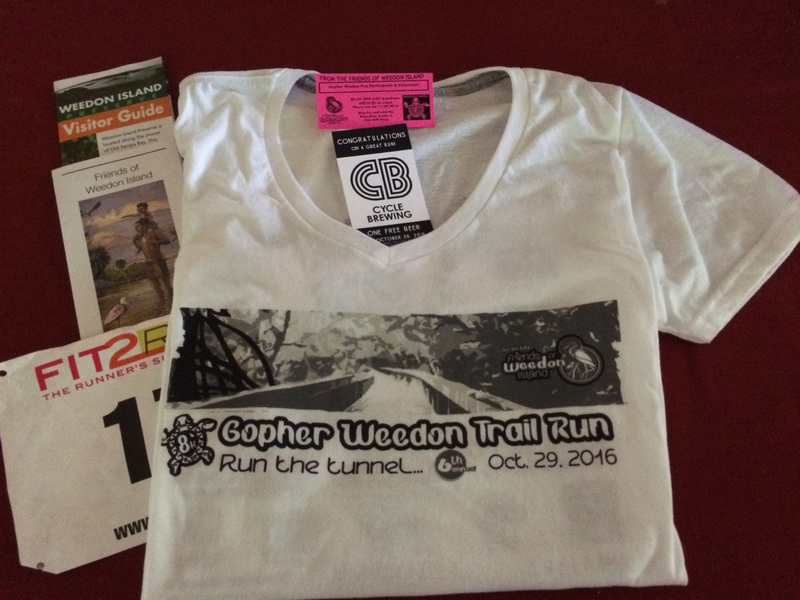 SWAG (Stuff we all get): This year's race shirt was white with black printing. All runners received a short sleeve tech race shirt and bib. Ladies shirt is v-neck. Mens is round neckline. 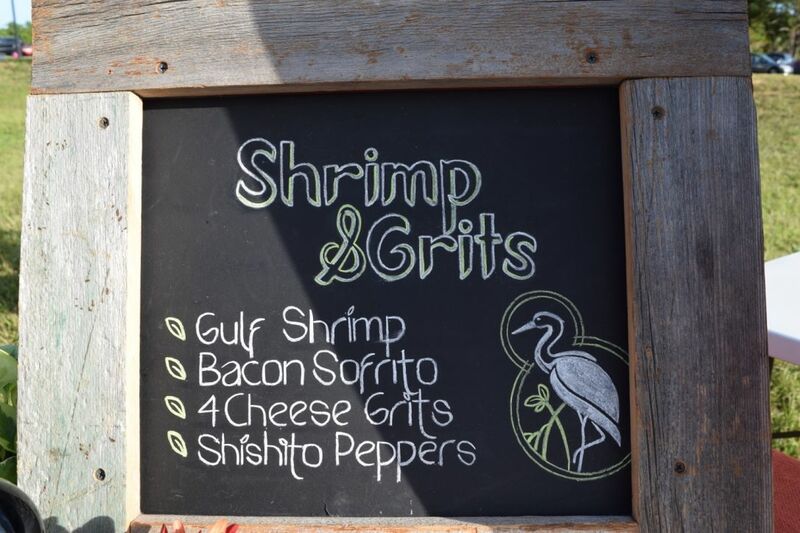 Race packets included a free beer voucher to Cycle Brewing and discount coupons for the Weedon Island Preserve Gift Shop and Ricky P's restaurant. 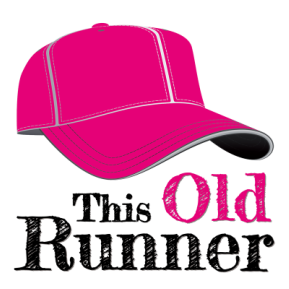 The race bib had a coupon for 10% off a regular priced item at Fit2Run. Surprise: Be prepared to run up a 3-story observation deck and ring the bell in the last mile of the race. The tower looks very steep on the approach, but is worth the effort. Post Race Festivities: The post race food main event was Shrimp and Grits from Noble Crust, a local restaurant. There was plenty of food for everyone, including bananas, oranges, cookies, veggies, and dip. There was lots of cold water and sports drink. The party takes place next to the finish line. Everyone lounged in the grass to eat and then watch the awards. Runners and spectators were encouraged to visit the Cultural and History Center after the race. Photos: Yes. The volunteer photographers did a great job of snapping pics of runners along the course and at the finish line. 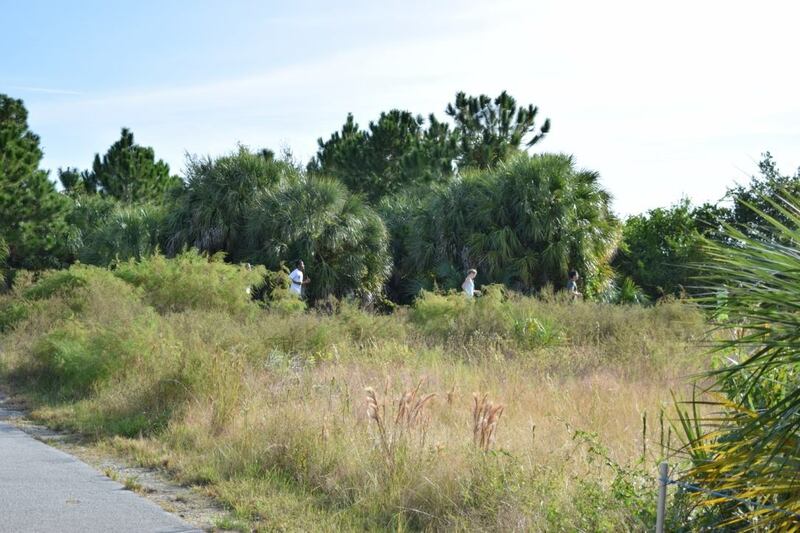 Free photos were posted to the Friends of Weedon Island Facebook page in mid-November. No notification, so watch the Facebook page for updates and info. Awards: No medals, but lots of great prizes. 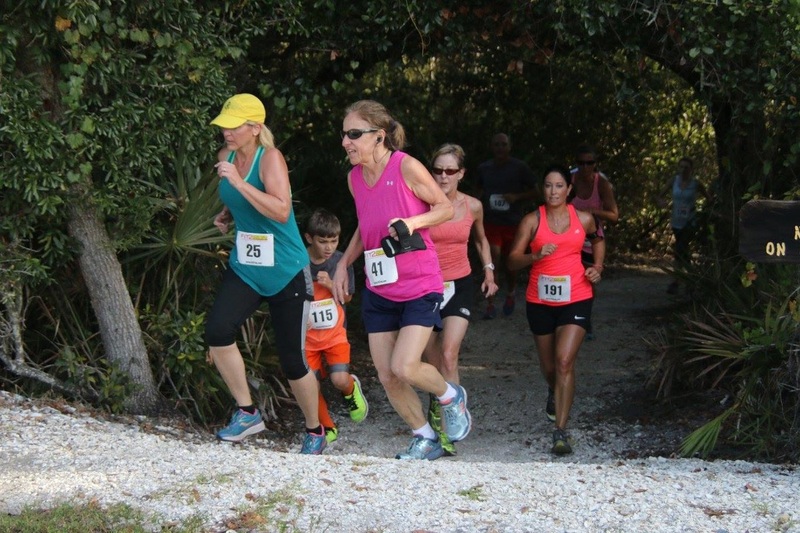 First place winners in each age group received a Weedon Island buff, plus gift certificates to Fit2Run, Noble Crust and the Weedon Island Gift Shop. 2nd and 3rd place winners received a Weedon Island buff. Timing Chip: No. There was a digital display at the finish line. Runners wrote their name, age, bib number and finish time on a paper record. Winners were tallied manually. Race Results: The results were posted on CoolRunning.com by early afternoon. Weather Report: It was 73º at the 9 am start. Humidity didn't bother me, but the forecast was for 80% humidity. -> Partly cloudy and sunny. Extra Info: Watch your step. A lot of the course is dirt and sand. There were tree roots and other natural obstacles. There seemed to be a lot of pine cones this year. Trail shoes were helpful. 2016 was my second entry in this race, and I enjoyed it every bit as much as my first year. You just can't beat the surroundings! I love running single file through the Mangrove caves, through the Pine trees and on the boardwalks. I'm practicing steady pacing this season, so my mantra for the race was to breathe and take in the surroundings as I ran. It seemed to work well for me. I managed a consistent pace throughout the race. The weather, participants and volunteers all make this a fantastic race. 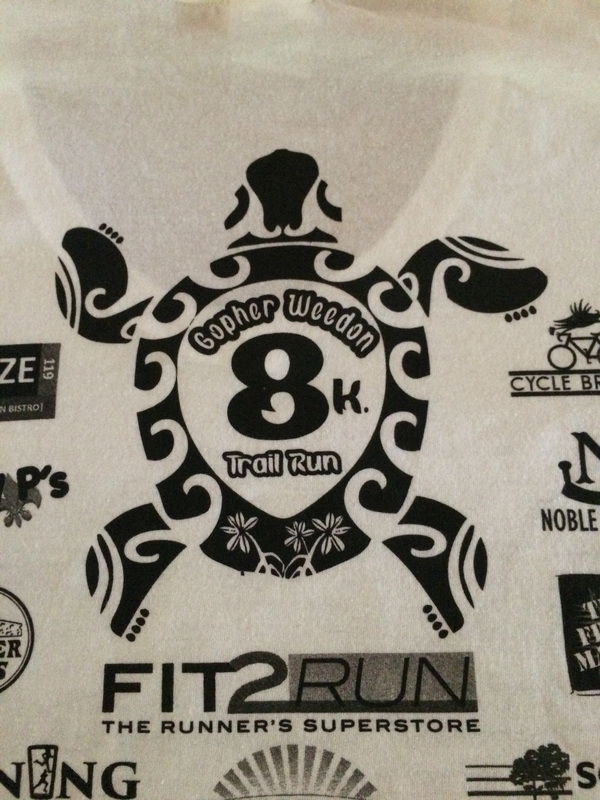 If you want to run the Weedon Gopher 8K Trail Race, register early. It sells out at 200 participants. Not the fastest, but maybe one of the happiest finishers? I'm pleased with my consistent 12 minute pace this early in the season.